Replacing the flooring in your home is a big decision, so you’ll want to have all the facts before you begin. When consulting an expert about your floor installation, it’s important to consider what type of floor you’re looking for in order to best decide on the proper method of installation. When choosing your materials, consider where the floor will be in your home, and what sort of traffic it will receive. Hardwood floors add a sense of elegance and style to your home. Wood choices abound in today’s market, and each type of wood offers a little something different to the ambiance of your home. 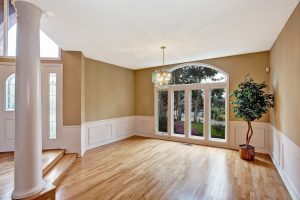 Hardwood is often the best choice for medium-traffic living areas. Hardwood floors may be installed one board at a time, or in groups of boards that have been pre-attached for easy installation. Your flooring expert will help you choose the best way to install your new floor for the most seamless appearance. Some woods may only come in one style or the other, so if the method of installation is important to you, you may need to choose your flooring based on that. Tile is a great option for your home’s floors, especially in high-traffic or spill-prone areas. Tile is durable, easy to clean, and incredibly versatile. When installing a tile floor, the method of floor installation will depend largely on what type of tile it is and where it will be installed. The most common types of tile are porcelain and ceramic. Porcelain is heavier and less likely to show unsightly chips and cracks, while ceramic is less susceptible to water damage or stains. Your installer will likely lay each tile down individually and attach it to the floor with a special adhesive and grout. No matter what materials you choose for your new floors, hiring the right floor installation expert is key to getting that seamless new look exactly the way you’ve envisioned it. Once the job is done, you’re sure to be floored by the results.